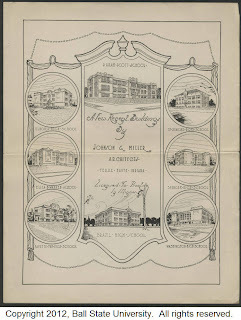 The online collection of Johnson & Miller Architectural Records consists of 123 projects spanning the long history of the architectural firm and its subsequent firms from the 1910s to the 1980s. Over the years, Johnson & Miller and its successor firms were responsible for designing numerous schools, university buildings, government offices, religious buildings, recreation facilities, hospitals, and businesses in Terre Haute, Indiana, and the surrounding area. MacMillan "Mac" Houston Johnson, who had studied at DePauw University and the Massachusetts Institute of Technology, originally opened his practice in Brazil, Indiana, in 1910. He was joined the following year by Warren D. Miller after his graduation from the architecture program at the University of Pennsylvania, and the firm then changed its name to Johnson & Miller. The partners established a second office in Terre Haute's Ball Building on Ohio Street a year later and maintained both offices until 1915. At that time they closed the Brazil branch and moved the Terre Haute branch to 105 S. Seventh Street. Warren's brother, Ewing H. Miller, also studied architecture at the University of Pennsylvania and joined the firm in 1919 after completing military service. The firm was then known as Johnson, Miller and Miller. Numerous fluctuations of the firm's principals were to follow in quick succession due to the untimely deaths of Mac Johnson and Ewing Miller a few months apart in 1923 and the additions of other architects. It became Johnson, Miller, Miller & Yeager (1924-29), Miller & Yeager (1930-45), Miller, Yeager & Vrydaugh (1946), Miller & Vrydaugh (1947-54), and then Miller, Vrydaugh & Miller when Ewing H. Miller's son, Ewing H. Miller II, joined the firm after also studying architecture at the University of Pennsylvania. When Allison "Al" Vrydaugh left the firm the name became Miller, Miller & Associates (1962-65) until Warren Miller's retirement which resulted in the name Ewing Miller Associates (1966-70). Ewing Miller later started Archonics Corporation, which had offices in Fort Wayne, Terre Haute, and Indianapolis. We are proud to present.....Sharley B. DeMotte Scrapbooks! The Sharley B. DeMotte Scrapbooks collection provides online access to 23 digitized scrapbooks containing newspaper clippings documenting the history of Ball State from 1925 to 1954. Sharley DeMotte, an alumna of Indiana University, came to Ball State in 1925 as a faculty member, teaching English and journalism classes at the college until her retirement in 1954. In addition to her teaching duties, DeMotte was the founder-director of the Ball State News Bureau, the forerunner to University Marketing and Communications, and served as an advisor for all student publications, including the Ball State Daily News and the Orient yearbook. Her collection of scrapbooks includes newspaper clippings from student and local publications and documents the social, cultural, and administrative history of Ball State from 1925 to 1954. The scrapbooks are arranged chronologically, with each book covering one academic year or a range of years, and are available to be searched full-text. A significant portion of the scrapbooks in this collection document the impact of World War II on Ball State, including the establishment of branches of the Army Specialized Training Program and the Civilian Pilot Training Program on campus. Articles regarding Ball State students contributing to the war effort overseas are also heavily documented. In addition to documenting Ball State's contribution to the war effort through scrapbooking, DeMotte was instrumental in coordinating correspondence between Ball State community members at home and in war. In 1960, DeMotte was honored as a namesake for DeMotte Hall in the DeHority Complex dormitory on the Ball State campus. Sharley DeMotte passed away on January 24, 1978 at the age of 89. A finding aid for the physical collection of Sharley B. DeMotte scrapbooks held in Archives & Special Collections is also available. We Brought The Sixties Back! We are pleased to announce the addition of the 1960s to Ball State University Libraries Digital Media Repository! 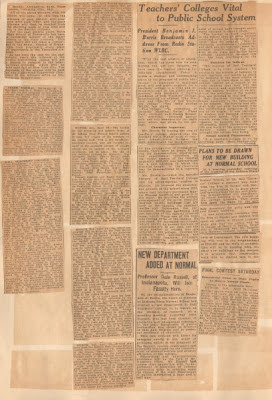 The Ball State University Student Newspaper collection provides access to full-text searchable digitized student newspapers from Ball State's history, dating to 1922. Included in this collection are The Ball State Daily News (1968-present) and its predecessors, The Ball State News (1937-1968) and The Easterner (1922-1937). At present, issues from 1922 to 1969 are available electronically. This collection documents Ball State events, issues, and life throughout history as well as student viewpoints regarding campus, local, national, and global news. So come and take a look at what was happening at BSU up until the end of the 1960s. What about the 1970s? Not to worry, they're on their way too. The Ball State University Provost's Lecture Series collection provides access to video recordings and published text of lectures given as part of Ball State University's Provost's Lecture Series. 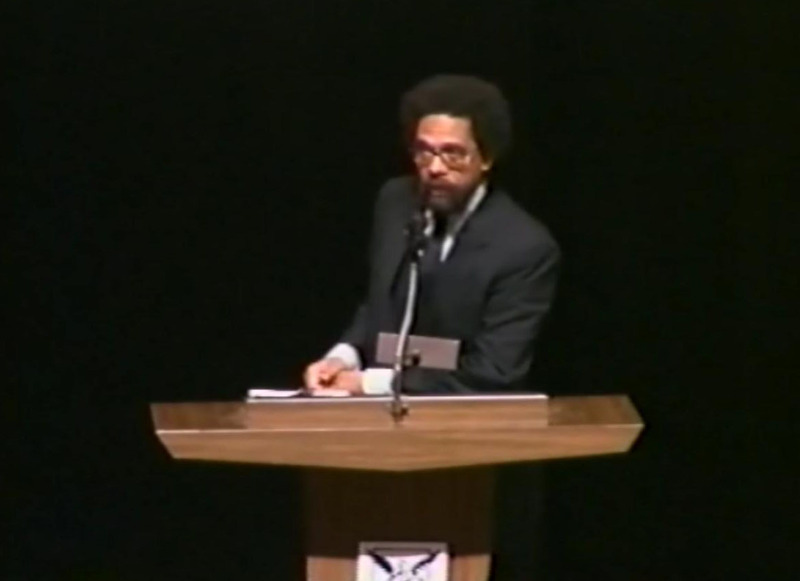 The series, which began in 1985, brought scholars and public figures of national and global significance to Ball State University to deliver lectures for the benefit of both students and faculty. Introduced by James V. Koch, then Provost and Vice President for Academic Affairs, the series was coordinated by John Koumoulides, Professor of History. Clicking on the image will allow you to browse the items in the Digital Media Repository. Lectures given during the 1987-1988 and 1988-1989 academic years were published in a two-volume series entitled Perspectives on Culture and Society. These lectures have also been made available individually in this collection. Assorted lectures from other years were recorded to video and these recordings are available in this collection as well. Video recordings currently available in the collection range in date from 1991 to 2005. 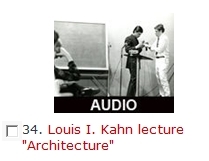 The College of Architecture and Planning Guest Lecture Series Recordings collection contains digital audio files made from recordings of lectures held at the Ball State University College of Architecture and Planning since its founding in the 1960s. The college has a history of fostering a vibrant guest lecture series that brings numerous architects, landscape architects, designers, urban planners, and preservationists to speak to the students and faculty. Some of the important design professionals reflected in the collection are Louis Kahn, Nathaniel Owings, Evans Woollen, and Ewing Miller. Most of the early lectures were recorded onto audiocassette tapes which have been digitally enhanced for optimal listening. Depending on circumstances during the original recording, the quality of the audio recordings can vary. The materials presently available are the first digitized installment of 50 audio recordings in the collection that contains over 400 recordings. 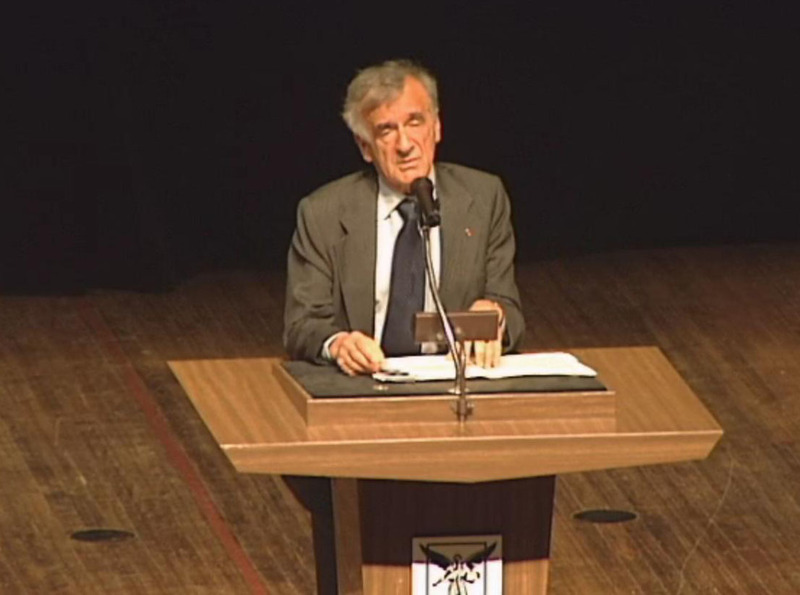 More lectures will be added as they are digitized. Ladies and gentlemen, start your research! The Ralph J. Satterlee Indianapolis 500 Photographs digital collection is now available in the Ball State University Libraries’ Digital Media Repository. 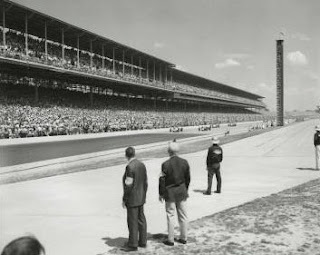 This digital collection includes over 800 images documenting Indianapolis 500 pre-race and race day events from 1960-1973. These images visually portray the competition and interaction between the drivers, pit crews, car owners, and race officials during a storied decade of the Indianapolis 500. 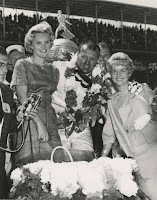 The collection also includes images documenting the many events and traditions surrounding the race including the 500 Festival parade, celebrity appearances, and the fan experience at the Indianapolis Motor Speedway. Ralph Satterlee was the editor and photographer of Borg-Warner's Gear-o-Gram magazine from 1944-1972. 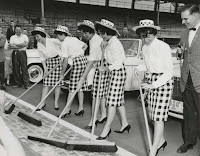 In addition to documenting company and community activities, he photographed the Indianapolis 500 extensively, serving as an official Indianapolis 500 photographer from 1960-1972. This status gave Satterlee unique access to document the race from a closer vantage point than the average fan. That access proved to be perilous, however, in 1971 when the pace car carrying Astronaut John Glenn veered off the apron and into the photographers stand moments after the start of the race. The accident did not deter Satterlee in his coverage as he took a photograph of the first aid tent while being treated for a broken nose and then returned to the track to photograph the remainder of the race. 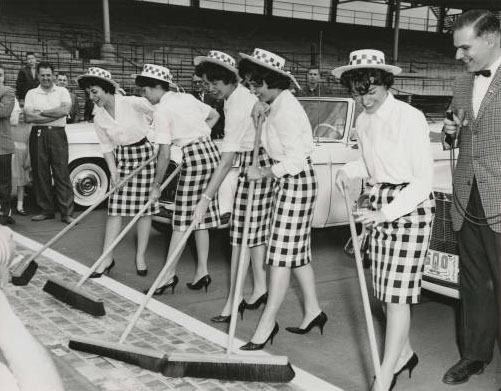 As an official Indianapolis 500 photographer, Satterlee used his camera to capture the moments on and off the track that came together to make the Indianapolis 500 the Greatest Spectacle in Racing. His photographs of the drivers, car owners, and pit crews leading up to the race portray the preparation involved, as well as candid moments of interaction between rivals. His photographs of the fans at the race capture the building anticipation leading up to the start of the engines. 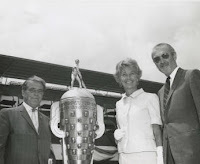 Satterlee documents the thrill of victory in his images of the presentation of the Borg-Warner trophy to the race winner. 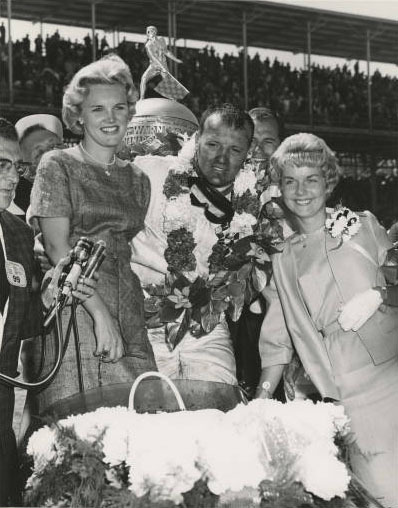 This digital collection is a great resource for students, researchers, and race fans studying the history and experience of the Indianapolis 500. It is also of interest for researchers examining such diverse topics as sports photography, the Borg-Warner Corporation, 1960’s celebrities, and sports culture. So take a few moments and explore this collection for your next research paper, to find pictures of your favorite driver, to try and find pictures of yourself in the crowd, or simply to prepare for that day in late May when race fans from around the world feel like they are back home again in Indiana. For more information about Ralph J. Satterlee’s photographs and manuscripts, please see our finding aid for the Ralph J. Satterlee papers or contact our Archives and Special Collections staff at libarchives@bsu.edu. 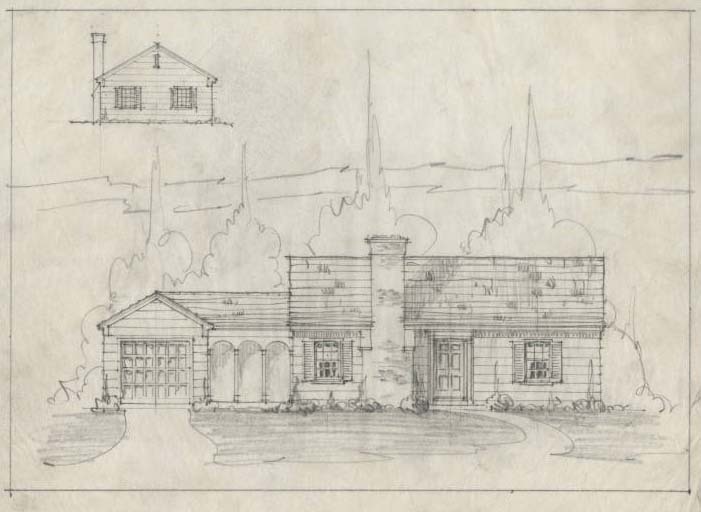 The Ball State University Libraries is pleased to announce the release of the Wilkinson Lumber Company Architectural Drawings digital collection. The collection contains 144 drawings made in the 1930s by the design service bureau of the Wilkinson Lumber Company. These drawings represent plans for 51 houses and one boat dock. 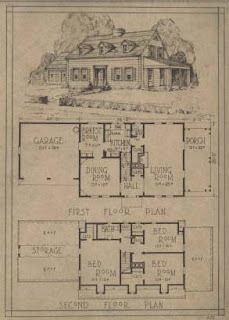 Only one set of drawings is associated with an address; the others appear to be stock plans that customers could purchase to build their house. This practice was widespread among lumber companies; several offered similar services, and many continue the practice. The Wilkinson Lumber Company was named for Indianapolis businessman Allen A. Wilkinson. Wilkinson attended a business college in Glens Falls, New York, as a teenager before moving to the Midwest with his parents. He started his business career in Muncie, Indiana, in 1882. Ten years later, he and his wife moved to Indianapolis, where he became secretary-treasurer of S. L. Greer Lumber Co., a business owned by his brother-in-law. Eventually, he gained an ownership interest in the business, which became Greer-Wilkinson and then, in 1906, the Allen A. Wilkinson Lumber Co.
Wilkinson eventually opened 36 branch locations and built a massive woodworking and joinery shop at 907 E. Michigan St. in Indianapolis, before his death in 1929. Anna Greer Wilkinson then assumed control of the business and ran it through the late 1930s. About 1946-47, the name of the firm was changed to Midland Building Industries. The building on Michigan St., then known as the Midland Building, remained actively used for lumber purposes into the 1970s. It was later turned into the Midland Antique Mall. Images: Wilkinson Lumber Company plans 482, 441. Wilkinson Lumber Company Architectural Drawings, Drawings + Documents Archive, Archives and Special Collections, Ball State University Libraries. 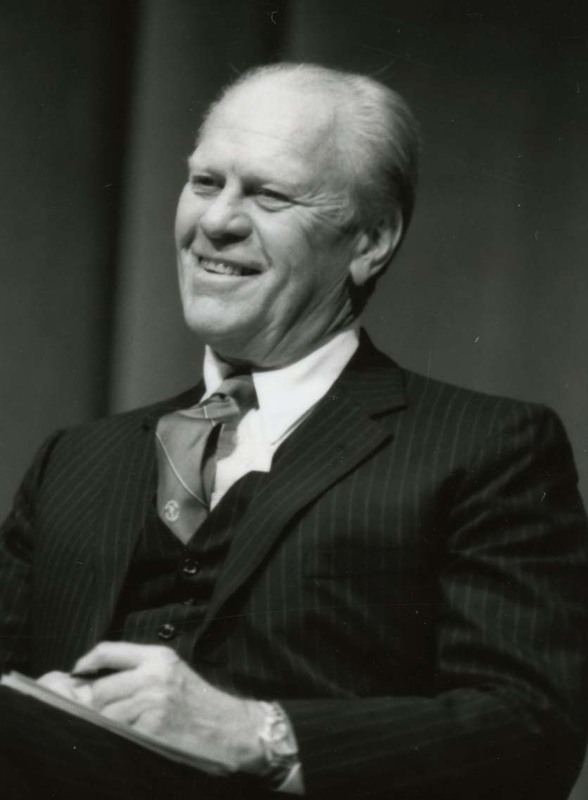 ﻿Did you know that former U.S. President Gerald Ford visited and spoke at Ball State University on March 28, 1985? Ball State students and faculty and researchers worldwide can now access a recording of his speech as well as recordings of other significant Ball State events, lectures, and presentations in the Ball State University Historic Audio Recordings collection, one of two collections recently added to the Digital Media Repository. 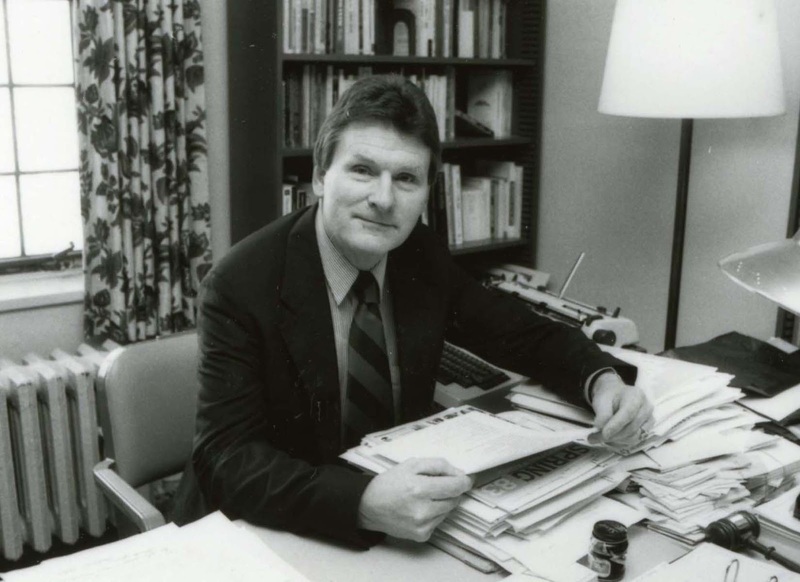 In addition, students, faculty and researchers can now access the Ball State University Faculty Lecture Series collection which provides online access to published, digitized lectures given by Ball State University faculty members dating from 1965 to 1981. The Ball State University Historic Audio Recordings collection at present contains 30 digitized audio recordings and will continue to expand as more recordings are digitized. Significant Ball State events documented in the collection include commencements, building dedications, and the Ball State University Recognition Day ceremony on February 12, 1965 honoring Ball State's being awarded University status. Other notable campus guests whose visits are documented in the collection include Indiana Congressman Andy Jacobs, noted anthropologist Ethel Alpenfels, and journalist and author John Howard Griffin. of the German Peace" is now available in the DMR. The Ball State University Faculty Lecture Series documents the work of Ball State faculty members in many fields, including the humanities, natural and social sciences, architecture, business, education, and visual and performing arts. Users can access items in the collection by volume or by individual lecture. The collection's homepage contains a list of all individual lectures available in this collection arranged alphabetically by lecturer. For more information about these and other archival collections, contact Ball State University Archives and Special collections at libarchives@bsu.edu. Center School Collection now available in Digital Media Repository! The Center School Collection is now available in the Ball State University Libraries' Digital Media Repository! The digital collection includes copies of the school's newspaper, the Center Chatter from 1930-1963 and personal memorabilia from graduates including announcements, pamphlets, invitations, programs, and photographs ranging from circa 1900-1967. Center School was established in 1905 and located in Perry Township, Delaware County, Indiana. The school was typical of Indiana`s small rural schools in that period. As the 1900s began and on through the 1960s, Indiana`s rural educational landscape became filled with the State's first "consolidated" schools. These schools were the bridge between the pre-twentieth century one-room schoolhouses and the modern schools of today. 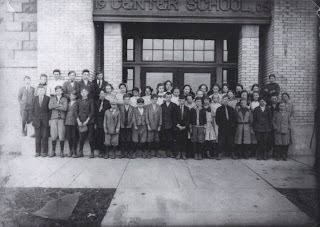 Center School`s enrollment, like most rural schools, was low. Its curriculum was limited to the basics of education. The history of education in Delaware County is intricately tied to Center School. In 1827 the county`s first school, a one-room school structure, was built in Perry Township in the southeastern corner of the county. The school was located about three miles northwest of where Center School would be located. By 1905 there were ninety-eight school buildings in Delaware County serving some 5,500 students, and Perry Township had four such schools serving approximately 200 students. One of those schools was located at the crossroads near the geographical center of Perry Township. Shortly after the turn of the century, property directly across from this school was purchased with the intent to construct a new, more modern school building for Perry Township. Although the construction of the school is not believed to have started until 1906, the founding of Center School dates back to 1905. After its construction, Center School took in and consolidated the outlying one-room schoolhouses. In 1908 the first set of students matriculated from the new school. By 1912, the school saw the first class of students to complete a full twelve years of education at its facility. In 1926, the school was enlarged adding a gymnasium with a stage, an assembly hall, a cafeteria and additional classrooms for high school students. 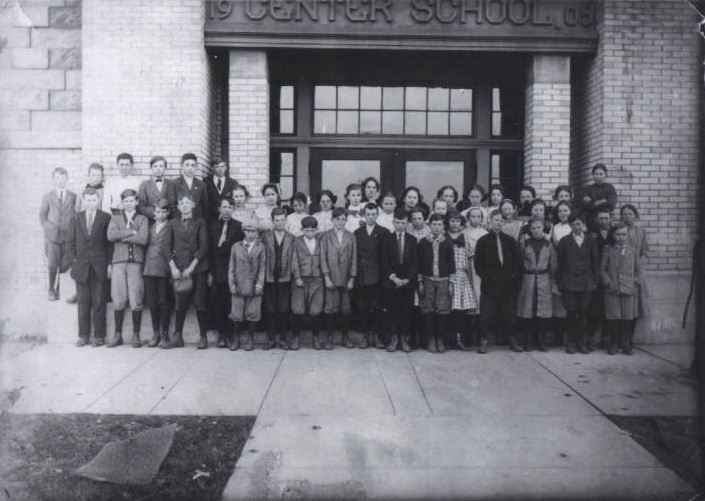 The school, which at that time served all grades from 1st through 12th soon, came to be known as Center High School. When school consolidations began again in the 1950s, Delaware County, not including Muncie City schools, had eleven high schools. When the consolidations ended in the late 1960s Center School was one of its many victims. At the end of the 1967 school year Center School was permanently closed and its remaining students were bussed to the newer consolidated school sites in the area. Shortly thereafter the school building was torn down and the property sold. For more information on the Center School Historical Collection, please see our Center School Historical Collection finding aid, or contact Archives and Special Collections at libarchives@bsu.edu. The Ball State University Libraries are pleased to announce the creation of the UniverCity Videos digital collection now available in the Ball State Digital Media Repository. Inspired by the Chautauqua adult education movement, UniverCity refers to a series of multi-day cultural programs planned by Ball State University for the benefit of the Ball State and Muncie communities that began in 1988 and occurred again in 1990, 1992, 2000, and 2002. Events included talks and lectures given by scholars, artists, advocates, and other speakers as well as artistic performances, cultural demonstrations, and panel discussions. Themes for the five UniverCity celebrations were "An Agenda for a Living Planet," "Uncommon Ground," "Touching Home," "Time to Time," and "Celebrate Community" respectively. This online collection contains digitized versions of video recordings held in Ball State University Archives and Special Collections. Prominent guests whose appearances at Ball State's UniverCity are documented in this collection include Nobel laureate and Holocaust survivor Elie Wiesel, actress and playwright Anna Deavere Smith, author and civil rights activist Cornel West, journalist Linda Ellerbee, chemist and Nobel laureate Roald Hoffmann, astronaut Sally Ride, and former United States poets laureate Robert Pinsky and Billy Collins. Click here for a complete list of videos in the collection. For more information about this collection, Ball State's UniverCity, and other archival collections, contact Ball State University Archives and Special collections at libarchives@bsu.edu. Before cell phone cameras and YouTube, even before DVDs, historical events and everyday activities were captured on 16mm film. Ball State University Libraries’ Archives and Special Collections has almost 900 reels of this antiquated film format that have been sitting on shelves for decades and have started to deteriorate. Now students, faculty, researchers, and everyone will be able to easily access and view these pieces of history in two new digital collections available in the Ball State Digital Media Repository (DMR), a project of the University Libraries. The Ball State University Historic Films and Videos collection contains films that document significant campus events, social activities, athletic events, lectures and notable campus visitors, and faculty research projects from the 1950s through the 1970s. You can see University presidential inaugurations, ground breakings and dedications for campus buildings, speeches and interviews of celebrities and other campus visitors, football games (including Ball State’s appearance in the 1965 Grantland Rice Bowl), Homecoming, promotional films for Ball State, and campus scenes depicting student activities and campus life. The Muncie and Delaware County Films and Videos collection features rare historical film footage of Muncie and Delaware County from the 1910s through the 1970s. The collection documents local businesses and industry, family life, social activities, buildings, and events. For example the Indiana floods from 1913 and the 1930s, the groundbreaking for the Westinghouse plant (now Progress Rail) in 1959, the Delco Remy UAW strike in the 1970s, and a tour of Camp Chesterfield (spiritual camp) in the early 1970s are all documented in these newly digitized films. The University Libraries’ efforts to digitize these historical films not only preserve the deteriorating films, but the project gives new life to resources that have been difficult, and sometimes impossible, for potential users to access. Outdated formats like these that reside in archives and attics contain valuable visual documentation of our past. By converting the films to digital format and making them available online in the DMR, the Libraries are providing revitalized resources for study and use by current and future generations of students and researchers. The creation of these digital film collections is the result of a highly collaborative effort that has included Archives and Special Collections, Library Information Technology Services (LITS), and Metadata and Digital Initiatives (MADI). These new collections will continue to grow over the next few months as more 16mm films are digitized and added. Please visit the DMR often to see what’s new in these interesting and historically valuable collections. You might see someone you know, or even a younger version of yourself. For more information, contact John B. Straw, Assistant Dean for Digital Initiatives and Special Collections, or Michael G. Szajewski, Archivist for Digital Development and University Records.